Cotton apron sewn from Penduka designed printed cloth. Available in white with grey printed village motifs. This apron comes with textile pencils so that kids can colour in the motifs. Cotton apron is sewn from Penduka designed printed cloth. 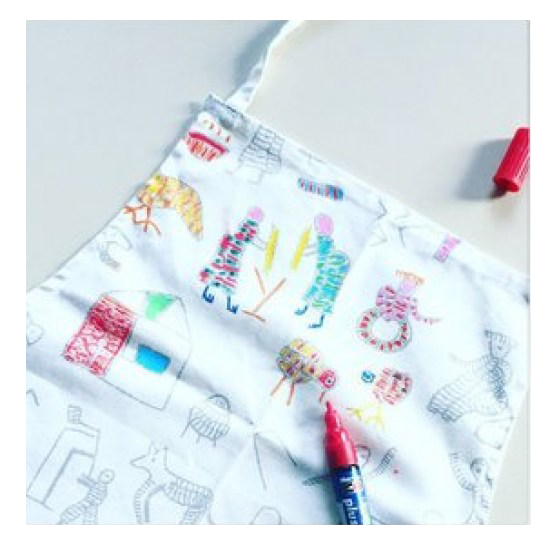 This apron comes with textile pencils so that kids can color in the motifs, therefore designing their one-off Penduka piece. The fabric is based on the embroidery of three women from the Penduka Otjiwarongo embroidery group. They have embroidered their village story in 3 weeks - which you can enjoy as well, on the beautiful fabric. Thanks to the embroidery and the earnings of the printed version, women earn their own income. Available in white with grey printed village motifs. Size 45cm x 52cm. Durable material, 100% cotton, machine-washable. For other specific color/ size variants or personalized motifs please contact us.